The city of Brussels is not known to be the most beautiful city in the world , which did not prevent him to shine and keep the right temperature bodies and minds, by his Home and small corners super friendly bars, restaurants, markets ... Moules-Frites (French Fries)-Beer mandatory once - at least! Brussels and its suburbs like an English city at first. One is struck by the architectural resemblance to the first visit. The resemblance is due mainly to the red brick walls. Feel free to stroll through the narrow streets of downtown Brussels. Miss the visit of the Grand Place, regularly hosted. also see the Cathedral of St. Gudula. 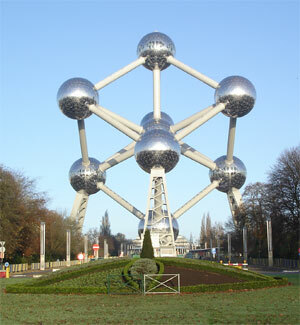 in the suburbs of Brussels, please go to the Atomium and eat there at lunchtime. The Atomium is unfortunately closed the evening. Nearby, the infamous Heysel stadium and a great film. The Atomium was built for the Universal Exhibition of 1958. To begin with not just one, you should visit the museum of comics, the Belgian Center for Comic Strip. 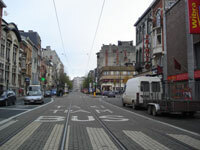 The museum is easily accessible in the heart of Brussels. If you come to the airport, 3 reasons to favor the train to the center: avoiding traffic jams, less products, contaminated and also save! Taxis are strong sympathetic, but expect to travel 50% to 100% more expensive than in France! Trains run every 3 stations: Gare du Nord, Gare Centrale and Gare du Midi, from 5:30 to 0:20. Buy the ticket at the station is much less expensive than the train. In town, you can hire bikes. Trams and buses are efficient. Add to bookmark this page Belgium " Visit Brussels " - Firefox do "Ctrl D"